We are so fortunate to have the variety of landscapes in Southern California. 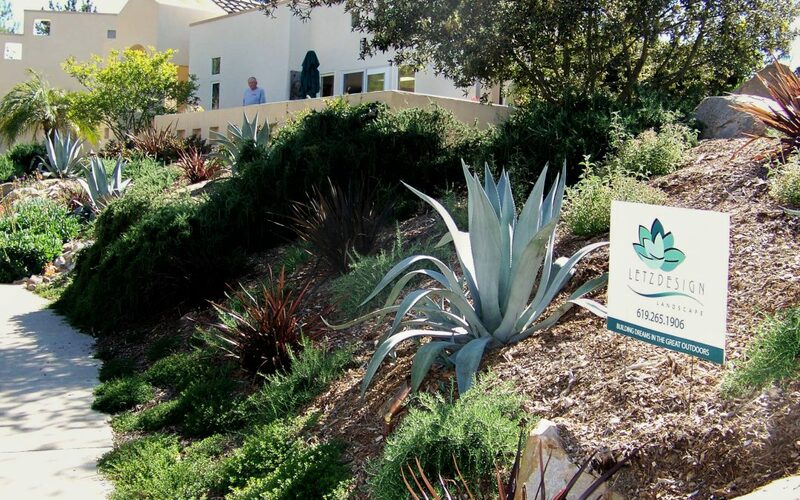 With numerous canyons carving out our terrain and more and more homes placed on hilltops or sides of larger inclines, therein lies the ongoing challenges of how best to design slope planting in San Diego. In the past the idea was to cover most slopes with ground-covering vegetation such as Ice Plants. And what a colorful impact when in bloom! However, these plants do require overhead spray irrigation and the weight of some of these plants actually cause adverse affects long term. I’ve seen the plantings on hillsides start to slump or slide down due to gravity and the aging of the plants as they get more dense and heavier on a slope. Our biggest challenge today is choosing the right plants for these slippery slopes that can be maintained with little effort and little water. 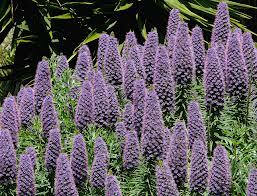 One avenue to consider is using California Native Plants. There is a great wealth of information from Las Pilitas Nursery, www.laspilitas.com on this topic. 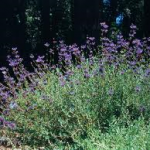 Some native plants to consider are Artemisia California (California Sagebrush), Baccarhis pilularis (Coyote Bush), Ceanothus species (California Lilac), Encillia California (California Sunflower) Heteromeles arbutifolia (Toyon) and Salvia clevelandi (Cleveland Sage) photo at right. Using natives on slope ultimately are a great way to go as over time and once established they may be watered only once or twice per month. Irrigation may vary as native plants still seem to do best with overhead irrigation. Natives will establish themselves with a strong root system in 18 to 24 months. Using the correct type of mulch is important as well. Mulch is useful as it keeps weeds out and holds the moisture in the soil. Using a shredded hardwood, more specifically, Redwood is the best as it will knit well on a slope and won’t slide off as other bark mulches may. And as a hardwood, it will not decompose as quickly with is important to native plants as getting too much nutrient at one time does more harm than good. 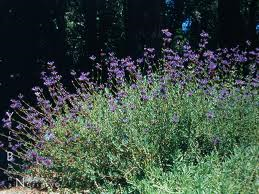 Non-native, Mediterranean plants can also be effect alternatives to groundcovers on slopes. Certain plants such as Rosmarinus prostratus (Trailing Rosemary),Bougainvillea species, Cistus species (Rock Rose) Juniperus species (Juniper – low growing types), Lantana species (Lantana – low shrub types), Echium fastuosum (Pride of Maderia) photo at left. Even certain types of succulents, Aloes, Senecios, Sedum can used interwoven in a slope planting design. And adding ornamental grasses are also a great addition for softer textures and movement within a landscape. These type of plantings will do great on a drip system on the slope. This saves water from both the loss of water in evaporation in spray and simple gravity of water running off the slope. Drip irrigation delivers water right to the root system and is the most effective way of conserving water. 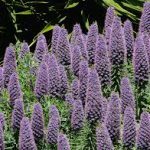 So the next time you determine your hillside is looking pretty bleak, reconsider the types of plantings you can use to add beauty, color and interest in your San Diego slope planting design. Contact Letz Design Landscape for expert advice and a successful outcome for long term success.